Thus, if household size did not change in a profound way during this time period (including from the PPNA to the PPNB), what accounts for the temporal and spatial patterned variation in the size of structures? I suggest that a series of factors influenced the size, internal organization, and sitewide spatial distribution of structures in this sample, and these factors varied in importance during this transition. These factors included natural aspects of individual site settings (essentially as a limiting factor, such as the use of caves or terraces), the degree of settlement permanence, the extent of reliance on domesticates (particularly cereals and legumes), the degree of household autonomy, and the total settlement population. The expansion in the size of structures from the PPNA to the PPNB is interpreted as primarily due to a trend toward greater use of internal space for domestic activities, storage, and production, and possibly the increased size of settlement populations. A number of studies have noted an allomet-ric relationship between settlement population and floor space (Cook and Heizer 1968;Wiesner 1974), and increasing floor space within larger settlements provided a mechanism for coping with crowding. One of the major changes asserted for the PPNB is an increase in the population of individual settlements (Bar-Yosef and Belfer-Cohen 1991;Bar-Yosef and Meadow 1995; Kuijt 1995). In addition, jealousy and interhousehold disagreements may have increased from the Natufian onward with greater settlement permanence and more circumscribed resources, particularly if subsistence plots were subject to household ownership (Byrd 1994a).This facilitated limiting information on the amount of foodstuffs and material within households and access to them, and provided an impetus for more production and processing activities to be carried out within structures. Hence, more interior space within structures was required to carry out these tasks and to store resources (Byrd 1994a; Redman 1983). Ultimately, this led to the formalization of interior spatial structure and an increase in building size in the PPNB. The size increase entailed the introduction of internal compartments either within pier houses or, as at Beidha, in subdivided basements that formalized the spatial discreteness of household production activities and storage. Thus, household autonomy increased over time. This formalization of internal space also may have aided in reinforcing the existing social order within households (Blanton 1995). Greater household autonomy is often considered to be advantageous for facilitating increased productivity, particularly since it is easier to single out noncontributing individuals. If greater household autonomy was reflected in the ability of some families to mobilize more labor by getting unattached individuals into their families (Netting et al. 1984), then we would expect that some structures would be considerably larger than others. However, during the PPNB there was considerable uniformity in size and style of buildings at specific sites in the core agricultural portion of the southern Levant (Byrd and Banning 1988).This shared external appearance may reflect aspects of a shared ideological tradition that aimed at promoting an egalitarian ethos by limiting external variation. With respect to variation between portions of the southern Levant, Natufian and PPNA settlements in the Jordan Valley were typically larger than their counterparts in more arid portions of the southern Levant as a result of some of the aforementioned factors, most notably greater settlement permanence and reliance on high-cost cereals and legumes, and possibly larger total settlement population. More interior space may have been needed and dedicated for drying, storing, and processing these gathered products, particularly during the PPNA. The trend toward larger interior spaces in the Natufian and PPNA of the Jordan Valley and subsequent PPNB throughout the agricultural zone did not occur in more arid southern and eastern areas and took place slightly later in time at Beidha (on the fringe of the dry farming zone today). The key factors for why settlements in these areas retained smaller structures during the PPNB entails seasonal use of settlements,with less reliance on domesticated plants and, hence, less need for storage and processing localities. Ethnographic studies of hunter-gatherers have noted that the degree of seasonality and anticipated mobility are important factors in determining the size of hunter-gatherer buildings (Kelly 1983;Kent 1990).Thus, the built environment of hunter-gatherers and small scale agriculturalists in the Negev (and other arid areas such as the eastern steppe/desert area) had a slightly different trajectory. This process included the introduction of more internal facilities for processing and production, and more activities may have been carried out within structures, but it did not entail an increase in the size of structures. A major unresolved question entails the extent ofhousehold economic autonomy and whether it changed over time. At what point, if any, did nuclear households become the primary unit ofproduction? Two possibilities can be offered. First, nuclear families were the key economic unit of production throughout this time sequence. Alternatively, related nuclear families (presumably extended families) shared resources and many processing and production tasks for portions of this time segment, particularly before the PPNB. The key lines of evidence for determining the degree of household economic autonomy are the location cf storage facilities, processing areas, and production areas (see also Rosenberg, this volume). If nuclear families were the primary economic unit, then these activities should be associated with each household in a redundant manner. If extended families shared these economic activities, then one may expect that adjacent structures (particularly those that are built close to or abutted to each other) were occupied by related households. These households may have shared storage facilities, situated either within only one building or as smaller adjacent storage structures. One would also predict variation in the range of in situ artifacts between such structures, indicating specialized locations where tasks were carried out. For example, one building may have a number of ground stone artifacts and the adjacent one have none. Two potential factors that are difficult to identify archaeologically complicate this issue: the potential presence of specialized structures only for processing foodstuffs for community-wide events or festivals (Hayden 1990); and localities where independent households share, for socializing reasons, a work or processing area but do not share resources. In general, the published material in the southern Levant lacks the level of detail needed to rigorously evaluate these hypotheses. 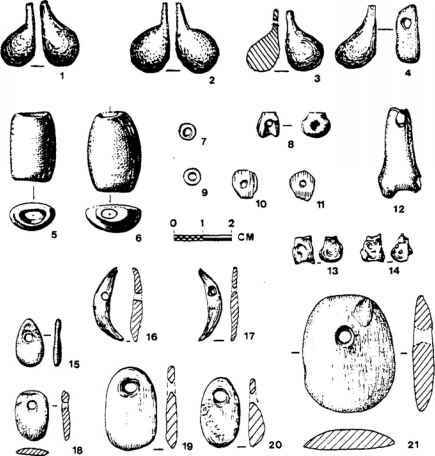 Examination of the evidence from PPNB Beidha provides preliminary insights into this question and highlights the complexity of the issue and the importance of formation processes in creating floor-associated artifact assemblages (Byrd 1994a, n.d.). Some sharing of activities between adjacent structures may have occurred at Beidha, particularly during the initial subphase (Al) of occupation. There is much less evidence for sharing during the final phase (C) of occupation, although sudden abandonments (ideal for gaining such insights) rarely occurred. Beidha Phase A is characterized by a somewhat higher frequency of in situ floor assemblages (62% versus 52%) and a considerably higher frequency of in situ portable artifacts (38%versus 6%) than phase C. Not surprisingly, phase A has more burned occupation episodes than phase C (57% versus 4%). Phase A buildings included clusters of portable artifacts in one or, sometimes, two internal areas, and this implies that certain activities were conducted in discrete areas or stored there for later use. A portion of each floor was devoid of any artifacts or features, and these open areas may have constituted sleeping locals. Amid the artifact clusters, a suite of related artifacts was situated directly adjacent to each other: these included polishing stones, hand-held ground stone, and pestles all in different buildings. This pattern may indicate that certain activities were group events where several individuals, perhaps from different households, participated. Unfortunately, comparable information is lacking for phase C.
Nonportable artifacts occurred both separately and in arrays on build ing floors in both phases. In some phase A situations, nonportable stone slab artifacts clustered on floors slightly separated from portable artifacts. In other phase A cases, as with the stone blocks on one floor and three querns on another, portable and nonportable artifacts co-occurred in a cluster. In both phases, querns occurred separately and within a cluster of portable artifacts. At least three querns were present in several buildings (two in phase A and one in phase C, a noncorridor building). Querns were also absent in two phase A burned buildings despite a sudden abandonment and large numbers of portable artifacts. This variability implies that associated plant food processing was not carried out in every domestic building but only in some buildings and perhaps on a larger scale. These trends correspond to architectural and spatial organizational patterns that indicate household autonomy increased over time. It does not preclude, however, that some sharing occurred between related households, particularly with respect to acquisition events. In addition, it appears that some processing and production activities (such as flint knapping and large-scale roasting) occurred in site areas that were much more public. It is possible that similar patterns may occur at other sites (see GoringMorris, Kuijt, Rosenberg, and Rollefson, this volume). At present, sample sizes are too small to clearly articulate the full range of patterns in domestic spatial organization. There is also a dearth of detailed studies of floor artifacts with a healthy consideration of the role that abandonment process and postabandonment events played in forming artifact assemblages on the floors of buildings. Indications entail the presence of a bimodal distribution of structures at some Harifian and Jordan Valley PPNA sites, the absence of hearths in some structures, and the occasional direct access between buildings. Potentially, some of these buildings may have served as interhousehold storage or task specific areas. However, much more information is needed to rigorously address this question, and this should be considered an important and potentially profitable line of investigation (Flannery 1993). In sum, the domestic structures from the Natufian through the Middle PPNB are interpreted as the residences of nuclear families. No major changes in the numerical composition cf the primary unit of residence occurred, and extended family residences were not present. The only possible exception entails the Early Natufian of the Jordan Valley. It is conceivable that the initial ramada-like structures were constructed to house multiple families. If so, this may reflect continuity with earlier, poorly documented social strategies that were characterized by more extensive community sharing behavior. Unfortunately our knowledge of pre-Natufian settlements in this area is extremely limited, and hence it is unclear if the Early Natufian spatial organization represents continuity or a major departure from the prior time segment (Goring-Morris 1995). Transformation did take place in how nuclear households interacted with each other and household economic autonomy increased over time. The present evidence is indicative of gradual changes prior to the PPNB with possible indications of economic interdependence between related and adjacent nuclear households. The onset of the PPNB witnessed substantial change in the nature of domestic space. Increases in the sizes of structures and their interior elaboration (more formalized areas for storing and processing) is interpreted as evidence of increased nuclear family household autonomy. Nondomestic public buildings are also well documented during this time period (and to a limited extent before that). These changes in domestic structures occurred during a period of rich ideological development and expression that functioned on the household and suprahousehold level (Bar-Yosef and Meadow 1995 Byrd 1994a; Cauvin 1972;Kuijt 1995; Rollefson 1983, 1986; Rollefson and Simmons 1987). Increases in the sizes of domestic structures, their permanence, and elaboration in the organization of interior space occurred initially in the area that includes the Jordan Valley and adjacent highlands. This area is considered to represent the heartland of early plant domestication (Bar-Yosef and Meadow 1995), and these organizational changes appear correlated with intensification of these resources and settlement permanence. A range of different expressions in local architecture, economic strategies, and the use of storage space occur in the more arid east and south.